Bach Collegium San Diego : JS Bach Six Motets BWV 225-230. Bach, historically informed, vibrantly performed. Johann Sebastian Bach's surviving cantatas number in the hundreds while his motets are few and unique among his compositions. They display J. S. Bach's unrelenting virtuosity and diverse contrapuntal style. Although many of them are believed to be from the early Leipzig years (1723-1730), some were likely assembled or reworked from extant material. The present recording marks the debut release of the Bach Collegium San Diego and was recorded in one of San Diego's finest acoustical spaces. The resultant sound, while luxurious and rich, produces beautifully transparent textures allowing Bach's brilliant counterpoint to be fully realised. The ensemble is comprised of 8-16 singers with organ, archlute and violone. In readings of great excitement, flexibility, subtlety, contemplation and joy the Bach Collegium San Diego proudly presents its inaugural release! License Bach, historically informed, vibrantly performed by Bach Collegium San Diego for your project. 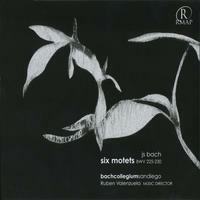 Play the music of Bach Collegium San Diego in your restaurant or store.